It’s been over 3 months now since Nest was fitted and I wanted to see if I had saved anything on my heating bills. No, I hadn’t, in fact I’ve spent more. But it’s a much nicer house to live in. We tended to manually control the thermostat before, nice and warm in the sitting room and cold everywhere else. I’m still more than happy with it though, just set and forget. Only the week before at work I'm shown the British Gas version called Hive and am really impressed. The thermostat is really solid and heavy to hold, so heavy in fact that it's not designed to sit flat, the smallest press on the unit activates the button. So it's to be mounted on the wall. They supply a conversion plate for your old thermostat or you buy the expensive Nest Stand... £29.95! The Hive Thermostat has batteries and so more portable, this I thought was the deal breaker when looking at both. 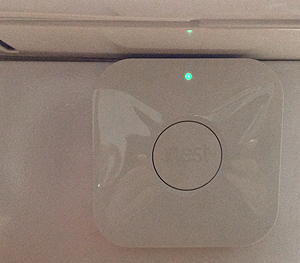 Actually the Nest really only needs to be in one place and I'll control it from the app. The old Towerstat you needed close to manually adjust it. Putting your evening "hot" cup of coffee next to it doesn't help so it's best out of my grasp. If you're used to setting a schedule for heating then it's hard to get your head around the learning side of the Nest at first. I went straight to the schedule and found it unintuitive to add a time and temperature, and that's just it, you don't need to. Turn it down as you go to bed, turn it up in the morning, all day on Saturday and extra early Sunday and it learns this. It learns how long it takes to heat up so if you're home at 5.30pm it's already warmed the house to what you set the day before. It even distinguishes days so if you work at home on Thursdays it knows this. It monitors the outside weather and adjusts for this too. So I wasn't happy drilling holes in the wall and wanted a stand for mine. No way was I paying £30 for it. Inside the Nest there is a proximity (PIR) sensor, when you walk near it lights up to show you the temperature, also far proximity sensor and light sensor. A Lipo battery, kind of wondered why after unplugging it continued to work. A humidity sensor, this shows the percent on the front screen and of course a temperature sensor. If you're desperate connect the Nest to your PC (it'll keep it charged) but you also get a 37mb USB flash drive, bonus!